Kuwait, a country in the Northeast of the Arabian Peninsula bordered by Saudi Arabia, Iraq, and Persian Gulf has a total land area of 6880 square miles and a population of over 3.56 million. Kuwait is classified as a high-income economy thanks to its immense oil wealth. Kuwait’s foreign policy of constructive cooperation and non-intervention has made it a staunch ally of the US. Other major industries are shipping, financial services, construction and water desalination. The government is keen on altering its oil-heavy image to that of a trading and tourism hub. Before striking it rich with oil, pearling was the major contributor to the economy, which was key to developing marine trade routes and thus ‘dhows’ (wooden boats made from teak) came to be. The best time to visit Kuwait is from November to April for then the nights are cooler. 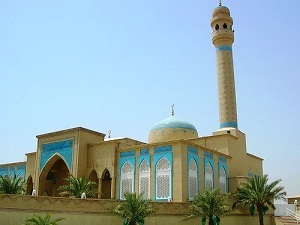 The major attractions of the place are the Kuwait Towers, Liberation Tower, Kuwait Mosques, Sadu House, National Museum, Bayt Al-Badr, and the Zoological Park. Other than seafood, Kuwait heavily depends on food imports. Kuwaiti cuisine is an amalgam of Arabian, European and South Asian cuisines. Lonely Planet Bahrain, Kuwait and Qatar 978-1864501322 $20 Twelve maps including a full-color regional map. Political, Historical, and Cultural Introduction along with accommodation & restaurant options and helpful advice to get around. Kuwait and Kuwait City Map by International Travel Maps 978-1553412816 $13 1:390,000 scale. Kuwait City Inset Map at 1:15,000 scale. The first stamps of Kuwait were a set of fifteen stamps released between 1923 and 1924 and were ‘Kuwait’ overprints on Indian issues showing King George V (KGV). The set (Scott #1 to #15) catalogs for around $350 mint and around $900 used. After World War I, Kuwait became an independent Sheikdom under the protectorate of the British Empire. The Gulf Rupee issued by the Reserve Bank of India was the currency in Kuwait at the time. Three other sets of Indian KGV sets were issued during the period till 1945. The sets (Scott #17 to #35, #45 to #57, and #59 to #71) are valuable fetching well into the hundreds. British Postal Administration issues with ‘Kuwait’ and denomination overprints formed the stamp issues of Kuwait until 1959. Some of these sets are reasonably valuable while others can be had for a few dollars. The most valuable set during this period were a set of three stamps released between 1950 and 1951 which were overprints on Great Britain Issues (Scott #286 to #288). The set (Scott #93 to #101) catalogs for around $80 MNH and $30 used. A set of thirteen stamps released on February 1, 1959 in the local scenes theme. The set (Scott #140 to #152) catalogs for around $30 MNH and $8 used. This set was the first original issues of Kuwait. The designs show pipe lines, Main Square in Kuwait, dhow, derrick, and Sheik, mosque and Sheik, and oil plant at Burgan and Sheik. Kuwait’s oil resources were discovered in the late 1930s. Kuwait has over 100 Billion barrels of proven crude oil reserves which is about 10% of the world’s reserves. Before oil discovery, the country was relatively poor with limited resources – pearl farming formed the major industry. Today, the oil revenue has made it the fifth richest country in the world. A long set of nineteen stamps released on February 1, 1964 showing a portrait of Sheik Abdullah. The set (Scott #225 to #243) catalogs for around $50 MNH and $10 used. Abdullah III Al-Salim Al-Sabah was the last Sheikh and the first Emiro of Kuwait. After attaining independence from the British on June 19, 1961, he introduced the Constitution of Kuwait in 1962 and the Parliament in 1963. Soon after, he declared himself as Emir and head of state. He died following a heart attack in 1965. A few other sets portraying the Sheik’s of Kuwait were issued over the years and the sets are relatively highly valued. A long set of eight blocks of four stamps released on December 1, 1973 in the Birds theme. The set (Scott #583 to #590) catalogs for around $120 MNH or used. The designs show mourning dove, Eurasian hoopoe, rock dove, stone curlew, great gray shrike, red-backed shrike, rufous-backed shrike, blacked-naped oriole, willow warbler, great reed warbler, blackcap, barn swallow, rock thrush, European redstart, wheatear, bluethroat, Houbara bustard, pin-tailed sandgrouse, ypecaha wood rail, spotted crake, American sparrow hawk, great black-backed gull, purple heron, wryneck, European bee-eater, goshawk, gray wagtail, pied wagtail, crossbows, tent-shaped net, hand net, and rooftop trap. A long sheet of forty two stamps and a souvenir sheet released on July 25, 1991 to mark the Liberation of Kuwait. The set (Scott #1150a-ap and #1151) catalogs for around $70 MNH or used. The designs show the flags of the forces who joined the international coalition against Iraq for the liberation of Kuwait: Sweden, USSR, USA, Kuwait, Saudi Arabia, UN, Singapore, France, Italy, Egypt, Morocco, UK, Philippines, UAE, Syria, Poland, Australia, Japan, Hungary, Netherlands, Denmark, New Zealand, Czechoslovakia, Bahrain, Honduras, Turkey, Greece, Oman, Qatar, Belgium, Sierra Leone, Argentina, Norway, Canada, Germany, South Korea, Bangladesh, Bulgaria, Senegal, Spain, Niger, Pakistan, and all forces of coalition. The first coins of Kuwait were Copper Baizas issued during the Al Sabah Dynasty in 1886 showing Abdallah Ibn Sabah and Date in Obverse. The issue is very rare. In the modern era, Kuwait started issuing coins in 1961 with the issue of Nickel-Brass Fils showing Value within Circle in Obverse and Ship with Sails in Reverse. The issue has high mintage (2M) and catalogs for less than two dollars in UNC. The proof version has very low mintage (60) and catalogs for around $30. Kuwait started issuing commemorative gold coins in 1981 denominated in Dinars. Coins $2 and up Common UNC Fils start around $2. Recent UNC Year Sets start around $10. Commemorative Silver Proofs start around $50. Solid Silver Proof Sets and Gold Plated 100 piece sets go well into the 100s. Paper Money $3 and up Common UNCs starts around $3. Shaikh Sabah issues of the 1960s in VF start around $10. High Value UNCs, low serial numbers, etc start around $50. Replacements, Scare Dates, etc go well into the 100s. Bundles, Specimen Sets, etc go into the 1000s. Visitors tend to buy packed sweets, ethnic handicrafts of Bedouins, head band and cloth, coins and stamps as souvenirs.